When your fireplace sits there neglected and unloved, the time is ripe for a makeover. 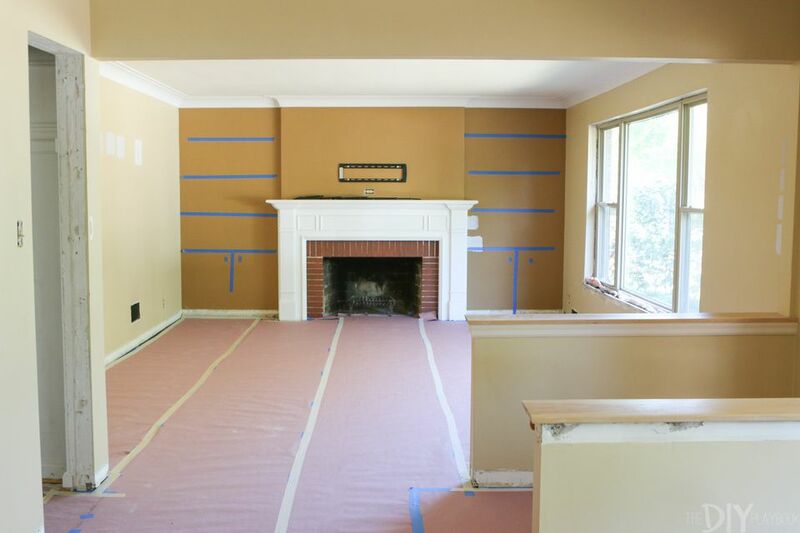 Rehabbing your fireplace doesn't have to mean a major construction project, though. It can be as simple as a fresh paint job on unfinished or previously painted brick. Or it can be a simple construction project, where you cover up the brick with drywall, wood, or tile. More involved fireplace makeovers might incorporate a lightweight masonry product called manufactured veneer stone, perfect for do-it-yourself work. With many of these fireplace makeovers, the homeowners aim to correct the mistakes of previous owners. Reducing the amount of visible brick is another common theme. In the end, this moderately easy, creative project is one that you will love to do. With its gorgeous traditional mantel, this fireplace already had some serious chops. But shelving was lacking and the red brick clashed with the rest of the fireplace surround. 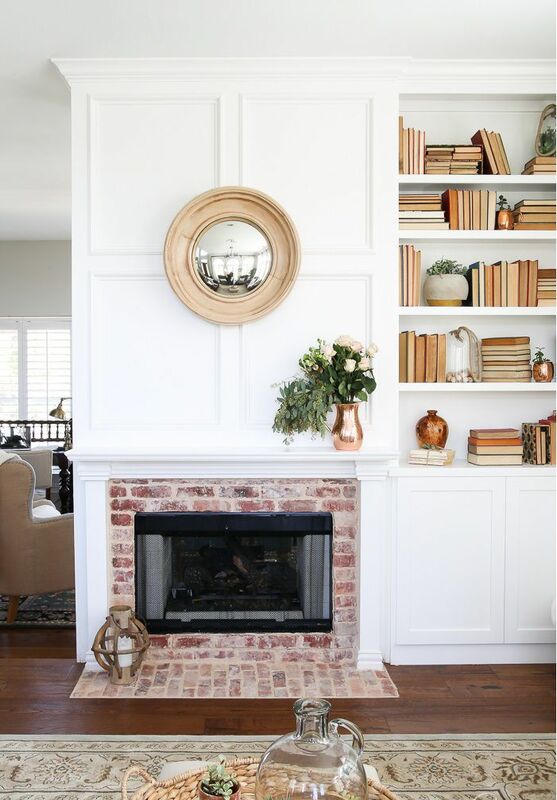 When Bridget at the design blog DIY Playbook revamped this fireplace, she covered the red bricks with white marble and continued the color up to the ceiling. Most significantly, she added spacious built-ins on both sides of the fireplace to show off fun, pretty objets d'art, as well as functional covered storage below. Stuck with a gloomy living room dominated by an uninteresting fireplace, these homeowners decided that it was time to make a major change. With this gorgeous makeover, a live edge wood mantel now graces the top of this fireplace. The drab, featureless tile surrounding the fireplace has been replaced with stunning artisan tile that catches the eye the minute you walk into the room. It wasn't so bad, this fireplace. But Rachel Moore of the blog Pinteresting Plans wanted it to look cleaner. The dark tile hearth, especially, made it look unfriendly. The painted, exposed brick made it look like every other fireplace. To dispel the gloom of her fireplace, Rachel traded out that one thing she hated the one most, the dark hearth, for a more cheerful marble-look porcelain tile in 20-inch by 20-inch format. Wood wrapping covers up the brick for a cleaner, more traditional look. Brick, in ​limited quantities, can be a beautiful thing. The problem with home blogger Katie and husband's fireplace was that there was just too much of it. All of that busy brick was overwhelming. Even though it was just your standard-issue, innocent red brick fireplace, to home and design blogger Tasha it felt like a sad relic of the 1980s. She didn't want to spend a lot of time or money on it, so she decided to paint it. To achieve a whitewashed effect, Tasha cut the white paint with water to thin it out. She then rolled it on with a textured nap roller cover, followed by brush work. A wood stove inserted in the fireplace solves the problem of wood-burning fireplaces' energy inefficiency. Tuscan home style is long gone; that much is clear. But Jenny at the home blog Evolution of Style felt that the chief problem with her Tuscan-style fireplace was one of coordination. Her home's exterior was natural-feeling and Craftsman. Her fireplace? Not so much. It was time for a veneer stone job. With manufactured veneer stone running from the hearth, up the chimney, and culminating at the ceiling, this fireplace now has a more natural look that befits the home's friendly, organic style. Those black hearth tiles frustrated Sonya, owner of the home blog At Home With the Barkers. But chipping away mortared tile can often create more problems than it's worth. Then she devised an idea to fix it, all without breaking a single tile. By creating a type of box out of dimensional lumber, she and her husband were able to raise the hearth. This not only covers up those unwanted black hearth tiles, it gives the hearth greater prominence. Ledgestone veneer tiles cover the face of the fireplace. If an element of your home makes you groan every time you see it, it's time for a change. Allison Hepworth at House of Hepworths couldn't stand another day of looking at her peach-colored "wall of bricks," as she puts it. Is it hard to paint brick? Sure, it can be. Allison, too, found the prospect of painting brick intimidating, so she kept things on the simple side by minimizing her prep work and rolling out nearly all of the paint. While there was nothing overly wrong with this fireplace, the entire living room was getting a makeover. Why not include the fireplace in this thoughtful redesign? Brooke smoothed out the traditional lines of the fireplace by having her carpenter friend add elements made from primed white pine. But the true focal point is the apparently antique slab of wood that acts as a mantel. This is not a giant slab of reclaimed (and hard to find) wood. Instead, they created it from common one-by-eight Eastern White Pine boards from Lowe's. Stain and distressing give it an antique look. With the standalone fireplace craze long in the past, this one, owned by Rachel at Maison de Pax, still stood like a sentinel to the 1990s. Rachel actually had two problems. First, the fireplace was uninteresting. Second and most problematic, how do you connect this fireplace with the rest of the house? In a creative fireplace transformation that is nothing short of stunning, Rachel completely turned around the look of her old fireplace. She created beautiful shelving to physically and visually attach the fireplace to the house. And for another bit of lagniappe, she now has loads of storage space. Next, she added thin cut brick with an intentionally messy mortar job for a classic, antique look.